He has an MMA record of 10-2 with 6 of the wins being knockouts. He is an accomplished American wrestler. He is...Matt Hamill and he comes with quite a following. Dubbed the "Hammer" and the "Golden Boy", Hamill was born on October 5, 1976 in Loveland, Ohio. He got his start in wrestling under the coaching of his step-father in Loveland High School. He holds a silver medal in Greco-Roman wrestling that he earned at the 2001 Summer Deaf-Olympics, international games in which deaf athletes compete on a highly skilled level. 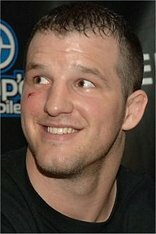 Matt Hamill also won the NCAA Division III National Championship in wrestling in 1997, 1998 and 1999 while attending the Rochester Institute of Technology in New York. His professional MMA career began with help from his exposure on the television reality show "The Ultimate Fighter" where he was trained by Tito Ortiz. He won by unanimous decision against Mike Nickels on April 6, 2006. Immediately after the fight Hamill was rushed to the hospital due to injuries which ultimately prevented him from continuing to the semi-finals. Shortly after, on June 24, 2006, Hamill took on the Brazilian jiu-jitsu fighter, Jesse Forbes on "The Ultimate Fighter" 3 Finale and won by TKO after only two rounds. Hamill went on to fight Seth Petruzelli on October 10., 2006 in Ortiz vs. Shamrock 3: The Final Chapter. Dominating the fight, Hamill won in round three by unanimous decision. Rex Holman was next on the list. At UFC 68:The Uprising, Hamill won four minutes into the first round by TKO. The winning streak would come to a halt though at UFC 75 in London, England when Hamill fought Michael Bisping. Hamill lost by split decision which stirred up much controversy. A rematch was set set for UFC 78, but Hamill had to pull out due to injuries. On April 3 Hamill took on Tim Boetsch and won via TKO in the second round. Though he won the bout, he was injured by a knee strike. Just when it seemed he was back on a winning streak, Hamill lost in UFC 88:Breakthrough against former UFC Middleweight Camp, Rich Franklin who won by TKO thirty-nine minutes into the third round. Hamill's next bout was at UFC 92 against Reese Andy who he beat in the second round via TKO due to strikes. Then he went up against former NCAA wrestling champion Mark Munoz in UFC 96 and with a right leg roundhouse kick to the head. He not only defeated Munoz and knocked him out but won the Knockout of the Night award. Hamill was set to fight Brandon Vera at UFC 102 but once again, an injury kept him from proceeding. This time it was a knee injury which was corrected by surgery. 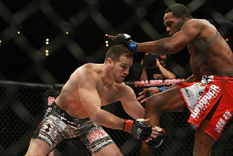 Shortly after the surgery, Hamill fought the light heavyweight Jon "Bones" Jones at the Ultimate Fighters: Heavyweight Finale. Jones went in the ring undefeated but was disqualified due to two illegal elbow strikes on the ground making Hamill the winner. Hamill sustained a dislocated shoulder. Hamill took on and defeated Keith Jardine on June 19, 2010 at The Ultimate Fighter: Team Liddell vs. Team Ortiz Finale. Hamill won by majority decision. Matt's next fight was against his former "TUF" coach, Tito Ortiz. The event took place at UFC 121 on October 23, 2010. He won by unanimous decision. So where does Hamill go from here? He is set to fight Quinton Jackson in May at UFC 130. Though Hamill has suffered his share of injuries and has gone intothe ring against the odds, he has been quoted as telling Fanhouse, "I love being the underdog." Perhaps it is just that, the fact that through adversity strength is born, that fuels the fire for Hamill, the deaf underdog fighter who seems to be doing pretty good at holding his own.